So what with Fate stuff permeating my brain the act of converting 2hus to Fate Servants popped up in my mind again. And so I decided to toss out some stuff. I was considering going game by game, but these take longer then I thought. Still if I can keep it going I'll use this thread for my writeups. As the battles have started, her words have proven prophetic. Three of the four winners have been destroyed by their own wishes. Still for those of us researching the Grail we've learned a great deal about the servants it has and potentially could summon. This is an account of those servants matching the golden age of Gensoukyo. Reimu's ability is based on her intuition, which when focused by the grail and her insane luck stat, becomes almost inescapable. As a ruler Reimu has the ability to use Command Seals, like a master. A Skill equivalent to "Instinct". Instinct is a sixth sense regarding battles, but "Revelation" accommodates all matters related to the achievement of a goal (for instance, choosing the most suitable path while traveling). The traditional Hakurei magecraft, focusing on divine spells and barriers. Reimu is adept at the spells, but lacks the deeper understanding to be a master, which is why she's relatively weak as a Caster. Skill in danmaku style dueling. While non lethal, the skill trains many combat skills. This level of mastery allows for near impossible dodges. The ability to call upon the 8000 gods. At this level the gods will perform minor feats for the summoner. In essence it's a simple way to expand the types of magecraft Reimu can perform without spending any effort learning. Treasures of the Hakurei line, they're generally low level holy relics that have minor properties. Like eating sweets and not getting fat, or turning into a cat. The ultimate spell of the Hakurei line, it borders on True Magic. Using the Yin Yang Orbs, Reimu creates a series of barriers that both removes herself from the outside world and traps her foe within an enclosed space where she can rain attacks down upon them. A NP that combines attack and defense. While the attacks are just powered up versions of her magic, her defense is nigh impregnable. Those that wish to attack her must solve both barriers before being able to strike at Reimu at all. She is immune even to attacks that can't miss because she is outside reality. The details of Reimu Hakurei's life are mostly shrouded in mystery. Her fame mostly comes from the respect (and occasionally fear) from those who lived alongside her, especially the Witch of Crimson Nightmares. However as the arbiter of a previous grail war, and someone who lived to protect the balance of Gensoukyo she is uniquely suited to the Ruler class. Investigation from various historian mages suggest she could be summoned as other classes, but without a strong wish she's unlikely to join the grail war any other way. While Marisa can't create the wonders many other casters can, she is incredibly skilled at creating many minor magic items quickly. Within a day she can create an entire arsenal of single use magic items. While a hedge mage, Marisa has a near instinctive ability to read into other people's spells. This allows her to quickly analyze enemy magic and even reuse it, though at lowered rank. Her own spells focus on Fire, Light, and Necromancy. A small device that carries the eternal flame, this simple tool allows Marisa to enhance her combat magic a full three ranks on a whim. The Imperial sword of Japan, it's rank is vastly decreased in Marisa's hands due to her not being of noble blood. However she can still use it's power to control the winds. When combined with the eternal flame, this can turn into a dangerous attack with near unlimited power. The culmination of her research, the potion made her a youkai, despite being designed not to. Like all Magician youkai, that spell is imbued on her soul, giving Marisa this unique ability. A strange power that hands the user a goal they are actively avoiding. For example, if Marisa used it while running away from a battle, a portal would open in front of her, dropping her into the fight. It could be considered an ability to make the users the luckiest or unluckiest person alive, depending on the whims of fate. Due to her lack of control over the power, Marisa rarely uses it. The Crimson Nightmare Witch has been famed for a long time, ever since she destroyed the City of the Dead. A witch feared worldwide for her mastery of attack magic, and her willingness to use it. Her true personality is that of an irreverent woman with little concern for rules or strictures. A caster who prefers to fight on the front lines, she's considered one of the most dangerous servants despite how common antimagic is in the grail war. Her master needs to be far more worried about their servant's thieving habits. As a fairy Cirno can't be killed by normal means. However the Saber Class lowers her natural ability. In this case she can fight on until her physical form is destroyed. No attack is fatal to her. No matter what kind of High-Thaumaturgy, magecraft of B Rank or below are negated. A variant of Protection from Arrows, this is Cirno's ability to freeze all incoming attacks. However Cirno's ability is so potent it can freeze anything that isn't elemental Fire. Even magic attacks can be affected by this ability. 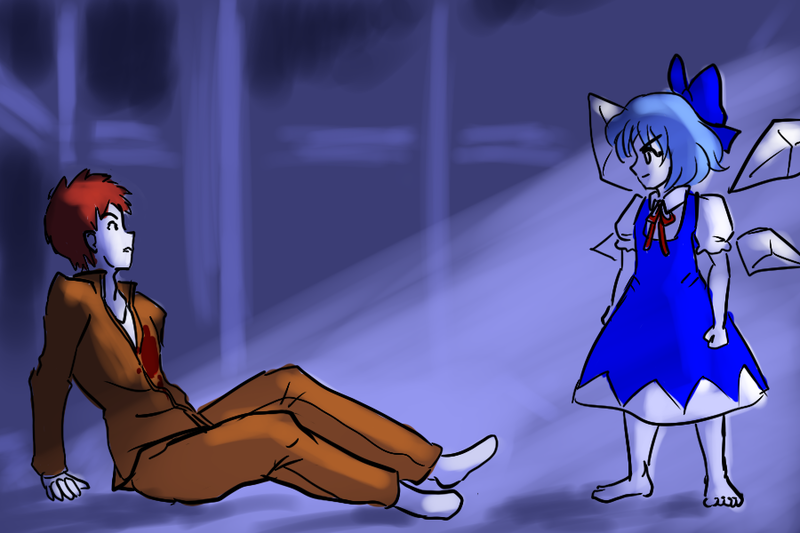 Cirno is immune to fear. In addition when facing an opponent who is a 'worthy foe' she will gain a one rank enhancement to all parameters. If the fight seems hopeless, this increases to a two rank enhancement. A sword that never existed, a myth created in the minds of the people, this ice blade is filled with the conceptual energy she absorbed when fighting in the Lunar Invasion. It honestly doesn't even count as a true NP, but it can injure other servants. Cirno can replace it at a whim. The perfect incarnation of ice. This power represents a complete cessation of movement. Cirno steals all the heat from the targets. However as a Saber, it's a slower process then normal. While she could freeze an entire castle, the process would take an hour. Even freezing a normal human would take thirty seconds. This means foes can flee the area of effect. In addition Cirno takes the heat she steals into herself, meaning she has to expend her master's energy to keep from overheating. The power is more effective on servants and Noble Phantasms, as their conceptual energy is easier for her to process. As a fairy, the freezing aspect of this attack is considered a Marble Phantasm. Cirno's true form is relatively unknown outside of Gensoukyo's locals, while stories of her actions during the Lunar Invasion have become greatly exaggerated over the years. Thus it is possible to summon her as many different "versions" of Cirno. She however will claim this is her future persona. Her strongest form. This version of Cirno is more mature then the fairy currently, but she still seeks battle ignoring the consequences. Masters will have a hard time keeping her from strong foes. funny this should be posted on the day I decided to watch fate/zero on a whim. I can almost see a variation the church/mage association of the fate-verse working as a system for an alternate universe touhou-world where gensokyo and the other closed places don't exist. Except instead of holy grail wars, you'd have smaller-scale 'incident' things on a more regular basis. Seija feeds on the hatred and loathing of the outside world. In fact, she needs that hatred. To be loved would hurt her. Rather than gaining strength from being loathed, in Seiga's case being loathed is her strength. The ability to convince someone that Seija is working towards their interests. Everyone knows an amanojaku is untrustworthy, but with this skill Seija can convince others that she won't betray them just yet. Over time it slowly instills the delusion that they can control or manipulate Seija. She will certainly use this power on her master as soon as she's summoned. Seiga's need to be hated makes her immune to any mental influence designed to make her friendly, happy, or helpful. However it is impossible to come to a true understanding with her. Or perhaps it is better to say, to understand her is to oppose her. The heart of an amanojaku is to lash out. To bring the strong toppling down, preferably onto the weak. As one of her race's most cunning and patient, Seija is the epitome of this existence. And with the power of a youkai she can briefly manifest this desire into the world and 'invert' an ability. This reversal can affect not only the physical, but the spiritual, or even the conceptual. A sword blow can shift to strike behind a wielder. A powerful blessing can shift into a curse. Even a person's desires can become inverted. However heroic spirits and the strong willed can resist its effects on mental attributes. The existence of Seija Kishin as a possible servant is a surprise given her small impact outside a few incidents. Even with her participation in a Grail War, she shouldn't rate status as a heroic spirit. However it seems this form is more a stand in for all amanojoku. As such she is treacherous, evil, and mean spirited. While she was alive she did her best to survive her crimes, but as a servant she's likely to destroy herself, just to screw over everyone else. As the tale of the Scorpion and the Frog goes, it is her nature to betray. Still it would be quite the fool who summons her. She's a weak servant, even ignoring the certain betrayal. It's possible she could use her power to change a berserker's mad enhancement to a sane enhancement, but that would require collaboration between masters, and would almost certainly end with Seija getting everyone involved killed. She can survive up to two days without a master. If she allows herself to shrink back to inchling size she can last another week, but at the cost of most of her stats. The traditional combat of the inchlings, she knows where to best strike to hurt her enemies. At it's highest skill even a needle could kill an oni. Shinmyoumaru's skill isn't as high as her ancestors, but she can still lower many protective abilities by a full two ranks with this. The ability to pilot her bowl as a flying boat. She has great skill, and is capable of flying in rough skies with little difficulty. Even storms might be managable by her small craft. Shinmyoumaru's normal danmaku was magical in nature, however her status as an archer shifted her attacks to be physical needles shot in her traditional patterns. This decreases her effectiveness against armor and other defenses, while removing the ability of anti-magic to block her attacks. The power to grant wishes. The hero's reward. However Shinmyoumaru never earned this reward, instead getting it from her ancestor. In her hands it is the call of limitless power, coupled with punishment for overreaching. The miracle mallet is stronger in her hands then it is in issun-boshi's, but much more dangerous to herself and her master. With a swing of the mallet any material wish can be granted. In addition it's power is such that it can grant awareness to items. But if used improperly or overused its power will spill out spreading chaos across the land until the master is drained dry. The only other famous inchling, she can only be summoned in her younger form, before she learned her lessons and settled down. Her older form lacks the wish that would allow her to seek a place in the grail war. This means her stats are fairly low, and she does not qualify for the Saber class. For an archer she's combative and brash, often closing to melee and refusing to retreat. However years of danmaku training and her weakness sense ability allow her to be a viable threat still. Charisma sufficient to lead a group of youkai. While never called a Queen, she had the same authority among her peers. Humans find themselves caught up in her aura, while youkai look favorably upon her. By feeling the rhythm of combat she has an instinctual understanding of the battlefield as a whole. She can predict the movements of her opponents even if she can't see them, simply by feeling the stillness and flow of the area. A youkai who slowly morphed into a god by those who revered her for her beauty and charisma. Her divinity is more an earthly divinity then a heavenly one, but even the higher gods must admit it. Raiko's existence has been a series of reverse causality events. She was given existence as a tsukumogami and then gained the magical power to become a tsukumogami. She called up thunder, and the thunder brought lightning. She wielded power over the storms, and so people called her a thunder god. And so her noble phantasm is that ability to create effects that 'seem necessary' for the world to make sense. The effect of this is that you can only stop her abilities by stopping the 'consequence.' The lightning she rains down can only be stopped by stopping the thunder. Once the thunder has rung out, the lightning will strike, even if it doesn't hit her target. Since Raiko is still alive, this is a copy created by the grail system. Probably. However it seems to have all her abilities and possibly even a bit more knowledge. This means Raiko has a strong wish. She is a carefree and spirited servant, who acts joyful no matter the hardship. But she does have a caring side, and her free spirit is matched by a cunning intellect. A terrifying servant, as her reputation would suggest. As a fallen celestial her divinity has dropped two ranks. In addition due to the nature of her actions she is neither 'holy' or 'unholy'. Tenshi can temporarily rank up her STR. Furthermore, no matter how many calories she ingests, her body shape will not change. Similar to natural body, this ability instead comes from her divinity and the power of the heavens. No matter what kind of High-Thaumaturgy, magecraft of B Rank or below are negated. Her magic resistance has not been lowered so much as modern magecraft has improved. When compared to older servants her resistance would have been considered A+ rank. No one is quite sure how she kept her power over earthquakes when she fell as a Celestial. Perhaps she has come to represent chaotic nature of the earth. However this ability lets her create small scale earthquakes and deform the land in a limited area. As a servant, the effect is toned down so it has little use as a weapon outside of making loose objects fall. A powerful Noble Phantasm even before Tenshi stole it, in her hands it has become the personification of "knowing without understanding." She can summon or dismiss the sword at will. In addition the blade can alter the weather in the area depending on the nature of other powerful beings. However it's true ability comes when it touches something. The sword realizes the nature of what it strikes. Tenshi can then command the sword to either channel energy that destroys or enhances what it touched. This energy can be formed into a massive burst of destruction capable of enveloping an entire army. However Tenshi herself doesn't know the truth of the target, or the energy used to damage or strengthen it. She just swings her blade to save or destroy. The legend of the Fallen Celestial Tenshi Hinanawi is well known. She was given the position without being worthy of it, and learned her duties during the height of heaven's rot. Her loud abandonment of her post, along with stealing several artifacts, led to the collapse and reformation of the celestial bureaucracy. Tenshi is arrogant and childish, but possesses a strong sense of justice. She fights for what she believes in, while utterly ignoring rules or decorum. She knows what is just, but she doesn't understand or even care why. As such she is a difficult servant to control. As a menreiki, Kokoro is innately in tune with emotions. Her emotions can't be manipulated. However her masks always show her current emotion hindering attempts at deception. Kokoro's charisma is unique in that it comes from her ability to manipulate the emotions of others. Those with high Magic Resistance attributes can ignore her charisma attribute. As a tool of worship Kokoro has absorbed some divinity. However she has no followers of her own so it's very weak. This represents Kokoro's divine connection to dancing. Makes possible to quickly learn and perform all dances. Furthermore, modifiers are applied to the exercise of dancing magecraft. Kokoro's masks were created to bring balance to Japan's emotions. However the truth was Shotoku crafted them to help control Japan. And so Kokoro's Dark Noh play drains the emotions of her enemies, leaving them paralyzed by apathy and at the mercy of her naginata. The effect is strongest against her 'partner' in the dance. However the technique takes some time to perform, meaning it's dangerous in a battle against many strong foes. Normal humans however will succumb quickly, allowing her to clear an area fast while she fights. Hata no Kokoro is famed across her home country, however no one is certain if she's alive or not. The summoning data suggests she can only be summoned from her later years, as the dark heroine who traveled the country, bringing her own brand of vigilante justice to those who drew her wrath. Masters will find her strong willed but less quick to battle then her rider form. She's willing to maneuver through the shadows and attack foes when they're at their weakest, though her lack of independent action and presence concealment hinder that. Suika's Strength and Endurance are vastly above human limits. However as an oni she has the traditional oni weaknesses to fried beans and holy objects. An enemy of the gods, she is revered by youkai. One might call her an evil god. Or perhaps a demon god. Oni are better than humans and Suika is among the best of the oni. This ability represents Suika's ability to perform any mundane skill based around training that does not include subterfuge at a rank superior to humanity. Millenia without fighting an opponent her equal has made her desperate to find a human who can kill her. Her subconscious desire to die fighting a worthy foe, causes a reduction in all statistics except Luck. Years of easily crushing humans has left her incapable of accurately judging and reacting to a foe's power. If facing an opponent with divinity lower than A, she can't be bothered to use her full strength, lowering her attributes by several ranks. Suika's recorded density manipulating powers strain the limits of even the grail system. As such her powers have been limited to roughly a tenth of what researchers suggest they should be. That's still enough to create localized black holes, and turn air into a dangerous explosive. The first great power that the Grail allowed her to keep. Suika's answer to humans attempting to swarm her with an army. She increases the density of Suikas in the area, allowing her to meet a foe with an equal sized unit. Even in numbers humans cannot defeat oni. This is the other power the grail allowed her to keep. This allows her to grow to immense size, taller than a skyscraper. After all oni are larger then anything humans can build. While her strength and endurance don't increase much, the boost in size means not only can her attacks affect a wider area, and enemy attacks must strike much deeper to hurt her seriously. Discovering an existence like Suika could be summoned by the grail at all was a huge surprise. In fact even Eirin's grail has to create a new servant category for her, and can't fully replicate her abilities. However seeing her Death Wish ability, a greater understanding of the Deva has been reached. If a magician could summon Suika, her goal would certainly be to fight and die against the strongest humans to have ever lived. This is unlikely to lead to triumph in the grail war. In addition the deva is certain to be a huge handful, ignoring her master whenever she wants. Thousands of years of experience allows Meiling to analyze and comprehend her foe's abilities even when in mortal danger. Every plan of escape and attack are measured for efficiency. Similar to Presence Concealment, this is the martial arts technique of manipulating chi to bring harmony with the world. Using it practitioners can become near invisible, in addition to hiding their presence as a servant. Preparing an attack reduces the concealment several ranks. Cancels Single-Action spells. Magic Resistance of the same degree of an amulet that rejects magical energy. A product of her chi mastery and meditation. By manipulating her internal chi Meiling can both heal herself, enhance her strength, and perform limited manipulations of external chi. These allow her to attack at range, though at reduced strength. She mostly uses it to combat enemy ranged attacks. Meling's strikes can shatter any earthly material by hitting miniscule weak points, or striking directly with chi. However the damage is limited to the material being destroyed. This gives foes with armor protection against her first attack. Similar to Tsubame Gaeshi, this isn't a true Noble Phantasm, but a mastery of technique that exceeds a Noble Phantasm. By understanding and mastering chi to an unparalleled extent, she can disrupt the paths within a foe's body to deadly effect. However she must land a solid blow to use this attack. In a sense this is the inverse of Tsubame Gaeshi. Kojirou's attack is inescapable when used correctly, but does not guarantee death. Meiling's attack is not unavoidable, but it's certain death if she hits. Hong Meiling is a distant figure, but with the revival of the Dim Mak school her story is becoming more well known. Unfortunately with such a long lived youkai it's hard to tell which stories are real and which are about other wandering martial artists. Researchers suggest Meiling would actually be a very friendly and relaxed servant. Especially for an assassin. However once battle starts she becomes a deadly opponent. Patchouli can create a 'Library', which is superior to a 'Workshop'. Patchouli's item creation skills are average, however she has spent a great deal of time to learn how to construct a Philosopher's Stone, and can create that item with little effort. At A Rank, a counterfeit immortality can be bestowed upon a target. In addition she can sacrifice the stones as imitation gemcraft gems. A Grand Master of Kabbalistic magic, Patchouli knows more elemental spells than any other mage in existence, in addition to understanding all other branches of magic. Beyond that as a true Mage, she has access to High Thaumaturgy even as a Servant manifested by the Grail. Her poor health however makes casting spells with a large number of lines difficult. Patchouli can call upon the library she was most famous for. The ultimate repository of the witch who named herself Knowledge. Originally miscatagorized as a Reality Marble, it's actually a transportation spell that displaces the surroundings with the actual Library. After centuries being displaced in time and space, it takes almost no effort for Patchouli to bring the Library forth. With millennia of research at her fingertips, Patchouli can create items and spells easily, as well as research whatever she desires. While hardly a combat magus, the temptation to summon the famed witch of knowledge has to be great. After all who wouldn't dream of reading the many tomes of Voile? It would be better to do this outside a Grail War however. In the event that she was summoned however it is likely Patchouli would try to leave the fighting to familiars and traps, creating a magical fortress around her Library. However if faced in direct combat she'd use her vast array of elemental spells to crush any attackers. Masters are unlikely to receive much direct opposition, but her tongue is very sharp. Sakuya can only hide the fact that she personally is a Servant, not even that a Servant is present. She does not do this to hide, but to maintain the facade that she's a simple maid because it amuses her. No matter how dangerous the situation, Sakuya is uninterested in analyzing and considering her opponent's abilities. Her moves are careless and whimsical. Comes from her Deathwish. Provides a moderate probability that mental interference magecraft will be rendered ineffective. Her knives combine the the physical power of a gunshot and the magical power of a Gandr shot. In addition due to her abilities she has a limitless number of knives. Total control over time space. Investigations if this is a True Magic are still underway. However no matter what this power is near unbeatable. There is no limit to how long Sakuya can stay outside of time, or the distance she can tweak. However as a Servant her abuse of this ability is likely to drain her Master. Her time stopping skills are the heart of her abilities. Perhaps the most powerful servant within the assassin class, Sakuya's Noble Phantasm is a invincible power. However her attacks past that are limited to her tiny amount of attack magic and her silver weapons. It would take a very powerful master to survive summoning her for long. Sakuya has no interest in good and evil, or right and wrong, as befitting the Scarlet Devil's first maid. She will serve happily, right up until the moment she cuts your throat for offending her sensibilities. Even as someone else's servant, she considers herself Remilia's maid. "Hey buddy, are you my boss?" Basically. Suika doesn't really fit into classes, and oni are insanely overpowered. I figured referencing superboss Shiki was the best "class" to use. Remilia can absorb energy from others by drinking their blood, replenishing her health and magic. However as a light feeder she can only drink enough to bring herself to full strength. If she managed to kill someone with this ability they would rise as a ghoul, but she can't stomach that much blood. She can transform into wolf, bats, or mist as a vampire. However she can't shift fully back, leaving her with bat wings even in human form. Remilia possesses the Mystic Eyes of Fate Manipulation, Jewel class mystic eyes. With it she can see everything in the future except herself. However she does see how her intended actions affect the future. This allows her to twist the future to best suit her desired outcomes. In action this gives her near perfect luck, as she picks the best future she can see. Remilia can manipulate blood, transforming it into attacks or using it to speed healing. As a vampire she can fight even on the verge of death. Wounds are meaningless until the fatal blow is struck. Not a true spear, but a mote of blood thrown at incredible speed. Unlike a lance Remilia can guide the spear mid flight. However it somehow still contains the divine essence of the Gungnir within its form. Just as Odin's spear represented inescapable Fate, Remilia's spear represents a Fate that seeks its foes. The Scarlet Devil is a well known figure, but even the Grail System has a hard time reading into her past. Researchers have claimed she's a descendent of Vlad III (very unlikely), secretly a True Ancestor (even less likely), or a completely unique demon (slightly more likely). There's also data suggesting a divinity rank and a second NP called Breaking Ragnarok. Whatever the case her questionable lineage has given her access to the Lancer class, even though her spear was actually a blood bullet. Bratty and smug, Remilia is actually a fairly reasonable servant if treated well. Her unique abilities within the Lancer Class give her master an advantage in any war. However those who press her limits should beware. She knows her master's plans, and is quite willing to act to preserve her status. A strange form of Mad Enhancement, Flandre is capable of conversation outside of battle, though understanding is limited to rare moments of lucidity. However once conflict begins she enters a rage that ranks up all parameters at the cost of her sanity. Flandre can absorb energy from others by drinking their blood, replenishing her health and magic. She doesn't use this ability without being told to however. She can transform into wolf, bats, or mist, and will do so reflexively to dodge large attacks. Flandre possesses the Mystic Eyes of Destruction, Rainbow class mystic eyes. With it she can see the point of tension within people and objects. That, combined with her magic skill allows her to instantly kill or destroy anything with physical form. Only high thaumaturgy or magic resistance can avoid this attack. While it could possess the same properties as Remilia's Gungnir in her berserker form it's just a huge fire sword she swings around with abandon. Were she summoned as a Saber, the blades true destructive abilities would be unleashed. Flandre transforms into a fine mist and flows towards her foes, using her mystic eye ability to attack everything she touches. However instead of directed magical blasts that seek to disrupt the point of tension, this attack somehow destroys the point of tension permanently. Victims of this attack will fall apart again even if they reform or are put back together. Destroyed things can be held together with some outside support, but if that support is ever removed, it will fall to pieces again. This ability is truly the end of matter. But as an attack it's questionable since Flandre is fairly slow when moving in mist form. While Flandre Scarlet was far more cunning than many know, she is inexorably drawn to the Berserker Class. Even if summoned as a Saber she would retain Mad Enhancement. Madness is just part of Flandre's existence. Some theorize her eyes gave her some insight to the Root, and she was unable to cope. Her level of Mystic Eyes are know to be dangerous for most beings. As a servant Flandre Scarlet is inherently dangerous. Childish, naive, and incredibly powerful, any master foolish enough to call upon her would need to work overtime. In addition she's certain to devastate the surrounding area. It would probably be best to eliminate any magus considering using her as a servant. All vehicles and all creatures excluding divine beasts can be ridden. She summons her steed, Frostmane for battles. She especially excels at small unit tactics with combined forces, and is capable of managing entire battlefields while still fighting. As a fairy, she will fight until the fatal blow is struck, ignoring even lost limbs. However she cannot recover from death. Her reformable ice shield allows her to block projectiles and low grade spells from one direction so long as she knows the attack is coming. Cirno is immune to fear and charm effects. While seeming like an ordinary spear of ice, research shows it has a deadly effect on spirits with Divinity and Divine protections. For unknown reasons, any divine protective ability will fail, and anything with Divinity struck by it will suffer extra damage and lose their divine protections. This effect appears strong enough to defeat even the highest level divine abilities. Stranger still, Cirno can reform the lance when broken. This variant claims she's from a past that "never happened." She also claims to have slain [****] so her testimony is fairly unreliable. However she conducts herself as a fey knight from the west, before the collapse and rebirth of the fairy court. Perhaps she's related to the strange disconnect between the eastern and western fairies. This Cirno acts purely as a knight, devoted to chivalry, though she practices a strange form to most knights. Despite being a lancer, she'll fight most foes with both blade and spear, acting more like a rider. However her noble phantasm is without a doubt the core of her power, thus the reason for her class. Yuki can create a "Barony" which is stronger than a workshop, however it needs to be staffed to reach its full potential. Capable of running a household. Fire elementals will avoid conflict with her, non magical fire won't burn her, she can ignore smoke, and she has a great resistance to magical fire. Yuki is a master mage, knowing a wide array of spells and high thaumaturgy. She has a focus on fire spells and transmutation, and can use both abilities at a higher rank. Unlike many other mages from the era, Yuki will use her magic to shapeshift herself and others instead of just boosting physical powers. Yuki's mage transformation turned her very soul into elemental fire, and this spell proves that to the universe. When used everything within range will catch fire instantly. Anything that can burn will, even if the substance is wet or has a very high flash point. This includes Yuki herself, though that won't hurt the mage. As might be expected, over time the number of casters available to the grail war has increased. Magicians always desire something great, just the lack of fame prevented Magi from advancing. Yuki stands slightly above the new crowd, both magically and due to her old position within Makai's hierarchy. As a servant Yuki goes full speed ahead. She'll use her weak summoning and powerful shapeshifting abilities to go on the attack. Masters had best accept her determination, or there will be trouble. She has little respect for the master servant contract, and even less respect for mages weaker than her. Creation of a Workshop is possible. Mai stole the body of a Fallen Angel. While this makes her two stages removed from true divinity, the original rank of Angels is such she still maintains a divine connection. The ability to convince others Mai is working in their interests. While she is famed for her betrayals of Lady Shinki's many enemies, she's capable of convincing targets that 'this time it's different'. Yuki is a master of summoning and binding, with knowledge of many other fields of magic on the side. Having stolen the body of a fallen angel, Mai can use her body's ability to corrupt the natural world around her. Corrupted areas and animals are hostile to everything except demons. The stain on the world doesn't linger past a day due to Mai not being a true fallen angel, but she can effortlessly continue the corruption if she's in the area. Another magician, Mai is far more stereotypically evil then her partner Yuki. The betrayer is well known for using her tricks to maintain Shinki's control over her netherworld, and that legend infuses her makes her even more dark when summoned as a servant. That combined with the fact that she rarely speaks will try any master's patience. A traditional caster, Mai will use her ability to summon familiars and demons to amass a army. She rarely fights openly, using betrayal and servants to get her kills. If forced into direct battle she's surprisingly strong due to her angelic body, but that's her last resort. Her fanaticism to Lady Shinki allows her to fight on even with grievous wounds. She can throw swords with the power of ballista bolts. Her fanaticism exceeds rational thought, giving her a tiny boost to physical stats, while making her sanity touch and go. However since her madness is focused on Lady Shinki, it's unlikely to become stronger unless someone attacks the demon goddess in her presence. While a poor mage, she has a natural ability to dimension shift, allowing her to move out of phase of reality. This lets her slip through walls, horde unreasonable amounts of swords, and dodge attacks easily. Yumeko can focus her hatred on an enemy. Within her mind they become a stain on the world needing to be wiped out to preserve Lady Shinki's smile. This hatred is so powerful it can tear the fabric of reality. Every Yumeko in every myriad reality comes to hate the target, and their attacks are so vicious they can affect this reality. Thus the victim will find themselves being attacked from multiple angles all at once. It's a very powerful ability just to throw a bunch more swords at someone though. No one has a clue what wish would draw Lady Shinki's personal maid into a grail war. Whatever it is, it must be incredibly powerful though, since it's obviously calling her from the future after she finally passes. It also must focus on something Lady Shinki wants, as the maid has little interest in personal issues. Unlike the perfect maid of Gensoukyo, Yumeko is harsh, judgemental, and shows little respect to her master. Her interest is only in advancing Lady Shinki's goals. Her current master would be nothing but a means to an end. One that can be replaced if needed. Mystia's song blinds and disorients opponents at night. The darkness becomes deeper, while lights have a horrible glare. In addition her song surrounds the listeners making it difficult to determine her direction from the sound. Unlike most Assassins Mystia has no Presence Concealment. Singing is innate to her, and that's very bad at hiding one's presence. A Skill that increases damage towards those of the Evil alignment, coming from her legend. Also, a Servant will also become a target if his/her actions are regarded as evil. Severing evil by means of evil; the ultimate judgement. She can fight even if seriously injured, and can keep singing even if injured unto death. By focusing on the grudges surrounding a foe, Mystia can sense their crimes. This is, in some cases, more effective than True Name Revelation to learn about enemy servants. In addition the hatred and dark spirits are awakened by Mystia's song, granting their power to her strikes. The more slain by the target, and the more hated her victim is for their killings the stronger her blows become. However those who didn't kill anyone, or whose victims forgave them are almost immune. The Night Sparrow famed for her defense of the human village, viewing her through the grail has shown a number of inconsistencies. For example, her disdain for humans is much stronger than previously considered, and honestly most of her hunting abilities come purely from her legend. Anyone who summons her is likely to be put off by her brashness, and freedom loving nature. However her unique assassin abilities grant both knowledge and a very strong attack to anyone who calls on her. One might call her an assassin strong against servants, as heroic spirits often have huge body counts. Tewi can grant good luck to anyone including herself, raising their luck stat by two ranks. She cannot decrease luck though. The ability to rapidly spin up a lie. Tewi's skill at this is superhuman, making it possible to flummox even geniuses. However those on guard often resist. She once had her skin torn off, coated with salt, then reapplied. Tewi can ignore any non fatal wounds despite the pain. She's not actually a very good Rider, qualifying only because of her legend. This level allows her to operate most vehicles and mounts. She hides her full divinity but as an earthly deity and goddess of the rabbits, she has a fairly decent rank. She once tricked an entire family of sharks into lining up so she could leap across the sea. In retaliation they tore off her skin. With this ability Tewi can turn the shark family's vengeance on her enemy, allowing them to tear at her foe. Her target must simply endure the rending teeth of the phantom sharks. The White Rabbit of Inaba would normally be a powerful servant, but she doesn't fit well into the grail system. Her "rider" class comes purely from her shark jumping habits. There's no real good reason to summon the con artist to a battle royal, though she'd have some dangerous tricks up her sleeve for sure. Tewi is irreverent, lazy, and very very hard to kill. She's also very experienced, and unlike other gods, learns from her past. Masters would be good to not underestimate her, even if she is a poor choice for a war. Even when not a caster, Reisen can create healing medicines and enhancement potions. A gold class mystic eyes, she can both see and alter waves, creating powerful illusions while seeing through the same. She can also create laser effects, though for limited time. And her illusions can cause madness if concentrated. It is possible for a Servant to stay in the world for one day without a Master. Rabbits dislike being alone, causing her to have a reduced version of the skill. While Reisen gave up her divinity after fleeing the moon, her position as Tewi's assistant / fall guy allowed her to maintain a small divine quality. Any gun in Reisen's hands quickly gets upgraded to Lunar Standards, making it capable of harming servants. This is based on lunar technology, so anti magic effects can't remove it. However it is, at best, an E class weapon, with no Noble Phantasm powers beyond that. Once Reisen was an immortal moon rabbit. She fled the moon and arrived on the impure earth, and over time came to embrace that impurity. She traded a sterile life of a minor god for the death of a mortal. And she can channel that acceptance of death into a bullet. Anyone struck by that shot will suffer massive damage, as their very vitality is damaged. However Reisen suffers a drop in vitality equal to half the damage she inflicts. This Noble Phantasm deals extra damage to immortals, servants with divine rank, or any being 'above' mortals. Eientei's top soldier for a long time, and Tewi's assistant, the one time deserter has become possibly the strongest moon rabbit of all time. That is at least how the other rabbits view her, and from that her legend has expanded. Data gathered suggests she's actually a very down to earth girl, and perhaps slightly cautious. As a rabbit she's also easily led. But when she does decide to take a stand she won't back down, no matter what. Eirin Yagokoro is a greater god, even with her renunciation of Lunar Society. She has some of the highest divinity. Eirin can create a "Sealed World" which is effectively an alternate reality. Within that world she can alter physics to create a maze, and hold several specialized workshops. Eirin can use any spell that isn't a True Magic. She has created spells unknown to modern magi. Her sole weakness is that she often forgets what spells she has access to and has to recreate them. Eirin can analyze anyone she meets, quickly building a profile of them and determining how they'll act in a variety of situations. This is most effective outside of combat, as impulsive decisions are harder to predict. Eirin Yagokoro can not be killed. Her existence is part of the universe, and causality will erase any lethal damage she suffers.. The only way to stop this process is to kill her Master or drain them of mana. How it is possible to even summon Eirin Yagokoro is a mystery. Possibly it is due to her creation of the grail. Whatever allows it, this is obviously just a facsimile, as all the hourai people will never die in order to join the throne of heroes. The grail system similarly limits her abilities. The real Eirin is much stronger. Still a simple look at her stats reveals her power. She would appear to be a strong servant to summon. Any mage believing that should probably be killed before they do something stupid. Eirin Yagokoro is a genius who acts in her own interests, and her only interest in this form is winning the grail. She will almost certainly kill her master to prevent any of her secrets from leaving. Add to that the fact that the only way to stop her is to kill her master, and death becomes almost certain. No one is quite sure why she has an E- rank luck stat. Possible reasons include the grail disliking her, her other stats being too high, or perhaps Eirin isn't quite as lucky as she appears. Sadly this is likely to remain conjecture. At this level it's honestly more of a curse. She can charm the entire world, but she can't guarantee respect. It's likely she'll end up with a mess of suitors again. Kaguya can create a court, superior to a Workshop. The court comes staffed with rabbit familiars. Kaguya has collected a large number of items. Summoning her as a Caster lowers the skill a rank, but she can still easily produce items of high quality and rarity at a whim. While Kaguya's magecraft is low, she has access to several powerful mystic codes and reagents allowing her to cast very powerful spells. Kaguya has a very high pain tolerance, and can fight through incredible suffering. Kaguya can not be killed. Her existence is part of the universe, and causality will erase any lethal damage she suffers.. The only way to stop this process is to kill her Master or drain them of mana. The right to battle the Moon Princess must be earned. Kaguya is immune to attacks from a person until the person offers her an item equivalent to a holy relic or noble phantasm. Kaguya of course gains the item, and becomes its owner. Counterfeit items can be offered to her, allowing a single attack, but after that blow the universe will retaliate against the cheater, turning their efforts against them. As the current owner of the grail, Kaguya can ignore command seals. This breaks her servant contract with her master, while at the same time using a lot of mana, so she quickly loses form after using it. While the grail refused to give us information on this ability, researchers know she used this at the end of the second grail war in her Archer form. It's unlikely the switch to Caster would remove it. Due to her summoning as an Archer during the second new grail war, we have a great deal of information on Kaguya. She claimed at the time to want to earn the grail for herself, as she earned her other treasures. She was much more active than reports of her claim, using her myriad of noble phantasms to nearly win, before her master tried to take her as his own prize and got killed. Her Caster form was listed due to her unique Noble Phantasm, and because listing her Archer's powers would be a research project in itself. Likely as a Caster, she'd be more defensive, remaining in her court and defeating enemies one by one. A mad desire to kill someone that she knows can't be killed. A rage surpassing reason. Her sanity is suppressed in exchange for a huge boost to all parameters. If her opponent is Kaguya or someone defending Kaguya, she'll gain another rank. Battles on even when torn to shreds. An unstoppable force of rage and destruction. Normally this would cover her skill in fire magic. However as a Berserker it's just her flinging her prana as flames towards her enemies. She has great skill in this despite being insane. A strange combination of the Hourai Elixir, and Mokou's natural talents that's unique to her. Her existence is part of reality, but the effort reality takes to remake her causes a violent fiery explosion. The size of the blast depends on the amount of effort needed to reconstruct her, ranging from tiny in case of arrow wounds to the size of a house if totally obliterated. Fujiwara no Mokou is the last of the Hourai people observed to be summonable by the new grail. Specifically her younger incarnation that seeks only death can be summoned. While her older version undoubtedly has a wish, the class nature of the grail forces her towards Berserker. This version of Mokou will fight everyone and everything. When there is no conflict she will simply wait for the next battle. Her master will have great difficulty controlling her. However her survivability is a terrifying power. It seems likely she'll be summoned at some point, and the city that the battle is held in will likely burn when she is. Since she's summoned from before she fully ascended to Bishamonten, she doesn't have her full divine powers. However she's still a powerful goddess. Rather than someone who finds treasure, Shou is someone treasure finds. People will bring her items, or she'll stumble into them. At her rank it's possible to even stumble across holy relics given enough time and luck. While similar to Golden Rule, Shou finds objects she treasures, rather than wealth. The ability to use thunder and lightning as a weapon. While it uses her Magic stat, it is less magecraft and more the direct reflection of her divine power. In addition this makes her immune to lightning and electricity. All Buddhist temples are considered her territory, as if she had territory creation rank B. This boosts her magic and her strength. A godly charisma, given to her to help rule the yakkha. Her younger self has yet to fully grow into it, though some find her fumblings endearing. The spear of Bishamonten, the strikes down the evil and the unjust. Unique among Noble Phantasms in that it is part of her being as a god, rather than a simple weapon. Thus when calling forth it's power, she reveals her own name openly, challenging evil. The spear burns brightly when it strikes those who have sinned. Of course merely opposing the war god is a sin, so it always burns. Evil servants or those who have defiled temples will find her spear even more dangerous. It's uncertain why only the younger Shou can be summoned. Perhaps it's due to her increased understanding of Buddhism. Either way, she is a strong lancer, using her divine abilities to gain advantage over her foes, then overwhelm them. As the ancient records show before Shou fully grew into her godhood, she was occasionally klutzy, forgetful, and hesitant. Some have considered calling her "Shou Lily" though as with all servants, she's not to be underestimated. Her divine spear is a massive threat to all who face her. Side Note : When asked why Nazrin is not a heroic servant, she replied that Nazrin opposes the idea of being a hero in her own right. It is Nazrin's duty to be the sidekick. A sentiment that has no place in a grail war. Perhaps if the grail system was used for a different purpose Nazrin could be summoned. Unlike other Casters, Byakuren does not create a territory outside her body, but rather she focuses that power inside her body. This grants her incredible physical prowess, at the cost of the magical boost territory creation normally provides. While Byakuren's Magecraft is relatively low for a caster, she has access to unique spells that no other living magician knows. Even other heroic spirits find her spells confusing. The charisma needed to start a cult. It won't convert those opposed to her ideas, but it will quickly gather those interested in the possibilities she offers. A fake "Natural" Body skill created by her magic. At this level it mostly allows her to keep her body shape no matter how many calories she eats. Mastery of motorcycles and motorcycle variants. Researchers are still baffled why she has this skill. Byakuren refuses to comment. The spell that made Byakuren a true magician. This is her dedication to becoming eternally youthful and strong, even if it makes her a demon. When she activates it, her physical abilities go up yet another rank, and she gains resistance to damage. Like her brother, Byakuren Hijiri is a very physical Caster, using heavy blows to defeat her enemies. However she uses black magic instead of divine power to accomplish this. While this means her strength isn't as great, she does have access to a number of magical spells and mystic codes to add to her strength. While it's odd for a monk who preaches tolerance and equality to take part in a war, everyone in the Gensoukyo region can attest to Byakuren's confrontational nature. She likely will push forth her unique brand of Buddhism with her words and her fists equally. Her master had best agree with her values if they don't want a turbulent relationship. Nue can make any object, including herself, appear to be something different. This is a self inflicted illusion, so each individual viewer decides what the object is, based on their own assumptions. If the viewer knows for sure what the object should be they are immune to this effect. Nue has the ability to shift into a bird with a snake's body, a cloud of dark smoke, or a serpent tailed gorilla/tiger. These are not part of her true abilities, but come from her many legends. When "slain" Nue can flee and restart the battle later. This comes from the varied legends of her death, and her escapes from them. Nue can use this skill once a day, and she must flee the fight. Not attempt to use the distraction for an attack. Nue's lance is a manifestation of plague and famine, the legend that birthed her form. It is the unknown malady that strikes the rich and the poor alike, and which leaves ruin in its wake. When called upon the blow can only be defended against with Endurance, instead of Agility. It flows around blocks, and moves faster than thought to envelop its foe. However as an earthly ill, it is ineffective against those who have no fear of sickness or need of food. Nue being summonable was to be expected. However strangely it seems her prefered class is Lancer rather than Assassin. Perhaps it's because of how the Unknown has changed in people's minds, or if Nue herself changed. Given it's uncertain if Nue is still alive no one can ask. Even if she would answer. As a Lancer she's still a trickster and a hit and run fighter. She's likely to use her seeds of unknown form to manipulate the battlefield, while performing hit and run attacks. If defeated she'll retreat for the day to reset her Disengage skill. Seiga is especially knowledgeable about taoist magic and necromancy. The ability to create items and servitors. Seiga especially likes building jiang-shi. When Seiga was a young woman she was taught many things by example. She was taught the Tao was more important than family, that wisdom brought power, and that love and friendship were transient. And so was born the wicked Hermit. However she desired someone she could trust. Someone who she could rely on even in her darkest times. And her twisted mind came up with a plan. She'd make someone who would protect and serve her, even beyond death. And so was born Yoshika Miyako. Where Seiga goes, she follows. Yoshikais already dead, and thus ignores pain and physical damage. If struck down she will rise again unless her body is totally destroyed. Yoshika serves Seiga unfailingly, using her own body as a shield, so long as her seal remains on her head. No magecraft can override this. Seiga the Wicked Hermit is not a very well known figure, but Crown Prince Miko still mentions her. The grail reveals her in all her twisted glory. Possibly one of the most dangerous hermits ever to live, if only because she believes in her warped philosophies. Another traditional Caster, Seiga will happily use Yoshika as a shield and sword while she prepares familiars and items to unleash on her enemies. However unlike most Casters, her master will have to keep her entertained, otherwise she'll go wandering out looking for fun herself. Futo can sail most small craft, even through the sky. She lacks the leadership skills to sail larger boats however. She knows a number of taoist spells and feng shui techniques, and has developed strong mystic codes. However she lacks the passion and skill to master the craft. Unlike other servants, Futo does not fully acclimatize to current time period. This leads to a mental pollution caused by her age. There's a small chance of negating mental interference magecraft, and a large chance she will misunderstand the orders from mental interference magic. Only those with similar Mental Pollution or who were born and raised in the same time period can come to a true understanding with her. Futo channels her fear and hatred into a torrent of fire. The ultimate form of arson. As someone who has betrayed her family, her friends, and the gods, her paranoia knows no bounds. And such she does everything she can to burn away that which frightens her. A flame that consumes even stone. However the damage it does to people and servants is purely incidental. The flames are more effective against areas that are under territory creation, or that have been sanctified in some way. While Futo has been a ghost for some time, she can be summoned in her living form. Her skill as a Caster is fairly low in the current era, so anyone considering that would probably bring her forth as a Rider. In fact as a Rider she is an excellent Caster killer. Something more useful in this era. However Futo is, as she was in life, lost in time. She will have a hard time working with youkai, is irrationally afraid of almost everything, and handles that fear with bluster and aggression. Fortunately she's quick to listen to her master, even if she complains a lot. Cancels spells with a chant below two verses. Cannot defend against magecraft on the level of High-Thaumaturgy and Greater Rituals. Her magic resistance as a Saber is actually quite low, but she uses Taoist ritual to improve it. The charisma needed to rule a nation. When dealing with people personally her charisma raises even more, due to the feeling of understanding she can project. Miko can read the ten earthly desires of humans, and can listen to ten conversations at once. This give her great insight into her allies and enemies. However she tends to get swamped in crowds. A master of taoist ritual, Miko's magecraft is lowered by being part of the Saber Class. She lacks many of her tools and mystic codes as well. While her sainthood has been revealed as a lie, as a descendant of Amaterasu, she still has claim to godhood. Miko's golden sword is wrapped in the blinding light of righteousness. She can use this to fire lasers, or just to dazzle her foe. However it hurts her own eyes a little as well, so she usually suppresses the ability if she needs to keep her sword drawn for a while. A representation of Miko's divine authority and right to rule. She channels her popularity, divinity, and magic into her blade, enhancing it to a massive size, then strikes. In addition the blow is fated to strike true. Dodging would be an offense, and missing an insult. So the blade is wherever the opponents stand. They can only block or resist. The attack depends a lot on Miko's status however. It loses power if her foe is not Japanese, if her foe outranks her (king vs prince), if her foe is chaotic, or if she lacks popularity in the current world. The number of situations where it actually strikes at A+ rank is actually very small. The former crown prince reborn, Miko revealed herself to be a Taoist master, interested in mastering and leading Japan into the future. This has led to many conflicts with the current rulers of the nation, as well as many points when Miko stepped forwards to save the realm. As a servant she's likely to seen cheerful and servile, but likely she'll manipulate her master from the start. She's honestly probably better as an Archer or Caster, but Saber is the closest she can get to bringing her full leadership abilities to bear (since she doesn't qualify for Rider). So she deliberately picks the knight class. The fact that Sabers are considered the strongest servants helps as well. She'll happily use her blade along with ranged spells to fight both up close and at a distance against all foes. Creation of a "Hideaway" is possible. While not giving a bonus to her magical abilities, it grants her Presence Concealment within the area. Mamizou can transform into almost any form, including other youkai and inanimate objects. She can also imitate other humans or servants with great skill. Her magical skill is more that of a hedge mage then a true master. However she has a number of mystic codes and artifacts, and her mastery of illusions is on a totally different level than her other magic. Mamizou is quite adept at gathering other tanuki to her cause. However she's less adept at handling other youkai. Tanuki are trickster who use their powers to befuddle and bring down those that think themselves strong. This spell uses the shapechanging and trickery of the tanuki to transform Mamizou's foe into a harmless animal or lesser youkai. This strange power is considered a Marble Phantasm, as it's linked closely to the nature of the floating world. Strangely Mamizou's own magic is sealed while this spell is in effect. It's not certain if the ability uses all her magic, or if the nature of the spell forces her to play "fair". The ancient leader of the tanuki, Mamizou is an oddball even for the time period. She's famous not for any one action, but centuries of little acts. And her abilities reflect that. The power to scurry back and forth between her hideout, harrying and harassing enemies and allies alike. Masters should expect that's how she'll approach a grail war. Interviews with tanuki state she's cheerful most of the time, and actually surprisingly helpful to people, unless they're foxes. Her rivalry with kitsune is irrational, but inescapable. She also can have a mean streak, but it's mostly for show. Mostly. Masters should remember that. It is possible for a Servant to stay in the world for two days without a Master. This represents Nitori's magitech engineering process. While much lower than her caster form, it does allow her to rapidly repair her gear and make ammunition for her weapons. Combines Prana Burst (Water) and Water Resistance. As an elemental creature of the water Kappa have control over it. This can be considered their Marble Phantasm. However it does not give them the ability to breath underwater. Even a Kappa can drown. A trick of her cloaking field, this makes her invisible to sight and sensors, and reduces her presence as a servant. However making attacks will allow others to guess her location easily. The height of magitech missiles, and her most common weapon. These are the weapons the breached the barrier between the world of "science" and the world of "magic" among youkai. While comical compared to modern weapons, they still pack a punch and can be fired en mass. The ultimate magitech gun, and the one she used in the Lunar Invasion. It combines a blue green laser with a high power water cutter, granting incredible penetrating power or impact if she adjusts it. Crafted personally by Nitori, it is the gun other kappa designers seek to match. Or surpass. Nitori Kawashiro is mostly known for being an advisor to the Inubashiri Shogunate and friend to the Crimson Nightmare witch. As one of the most famous kappa of the time, she became associated with all kappa of the period, and that was the era of kappa magitech superiority. As such it's strange she doesn't default to Caster, creating magitech wonders. Something in her nature views her warrior self as different then her creating self, so she responds to battle as an Archer. Nitori is skittish and reserved. Almost shy when talking with friends. However when battles start she becomes brash and confrontational. At least until she realizes she's outmatched. Still her plans work well for an Archer. She seeks favorable ground and position to unleash a powerful attack. While she had no divinity to start, upon ascending to the Shogunate she gained divine favor. She was sainted upon her death, allowing her to keep her quasi divine status that being Great Tengu allowed. Momiji was always one of the more tactically minded wolf tengu, focusing more on strategy and logistics than mere swordplay. As a elemental of the air, Momiji can control the winds as a Marble Phantasm. However as a wolf tengu her powers are considerably lower, even after her ascension to great Tengu. The battle techniques taught by the Tengu. As the Great Tengu, she of course has total mastery of those tactics. Provides bonuses to close-combat power such as swordsmanship, archery and spearmanship, as well as Skills such as Military Tactics and Magic Resistance. No matter what kind of High-Thaumaturgy, magecraft of the skills rank or below are negated. Her magic resistance starts high due to the Saber Class, and matures with the rest of her skills. While normally unremarkable, Momiji can replicate this shield given an hour. This means she can use it as a defensive Broken Phantasm when needed without losing it. Momiji rose from a mere patrol tengu to the Shogun of Japan through blood, and a willingness to sacrifice anything for victory. She's famed for breaking both her enemies swords and her own blades in order to get the killing blow, and each time she gained glory and power for doing so. Thus Momiji can use each of her swords as a Broken Phantasm. And when she does so she gains power and a new blade to replace it, until she reaches her ultimate power. A simple blade of the finest craftsmanship. It's main ability is to conceal her identity. When broken it allows her use the Disengage skill at rank A. A reforged executioner's blade, sworn to what justice a sword can make. This blade grants her the Executioner skill at rank B. When broken she gains strength in all her attributes. The sword of Kanako. A straight bladed sword that seems archaic, but strikes with divine power. This blade gives her Charisma at rank B. When broken her skills rise to their maximum. The first Shogun of the new era, and the first wolf tengu to hold the position. Momiji's rise to power has been covered by historians for some time. It's in fact quite surprising that she hasn't been summoned yet. Her powers and skills seem well suited to a grail war. It's possible that her surviving artifacts are just better protected than other relics. Far from the charismatic leader she's often portrayed as, Momiji is quiet and blunt. She might even be considered a product of a lost era. A samurai through and through. Despite once being Shogun, when summoned she considers herself a Samurai. Sworn to serve and die with honor. Only if her Master's actions would tarnish her legend or bring suffering to the innocent will she turn against them. And then her Master will find she has an iron will. Aya can create a "Study", where she writes and prints her papers. The battle techniques taught by the Tengu. Aya studied when she was a child, but she forgot most of her lessons by the time she became well known. Provides bonuses to close-combat power such as swordsmanship, archery and spearmanship, as well as Skills such as Military Tactics and Magic Resistance. Cancels Single-Action spells. Magic Resistance of the same degree of an amulet that rejects magical energy. As a elemental of the air, Aya can control the winds as a Marble Phantasm. At this level even gale force winds can be controlled. As someone who studied danmaku for a long time, Aya has an above average mastery of the art. At this level of practice, she can perform dodges even at high speed. Tengu apparently mastered the art of conceptual weaponry earlier than previously thought, though mostly by accident. Taking from the legends of cameras stealing the soul, Tengu empowered their cameras to capture magical energy. As a famous tengu of that era, and one of the most famous photographers, she has perhaps the most powerful camera, one infused with the strength of her legend. Aya's camera can absorb any magic or prana that it snaps a photo of, using that power to charge itself. This ability can affect any spell or ability short of True Magic, and can even damage servants, though the power is fairly small. She'd have to take several dozen photos to drain a servant, and they'd be able to fight until the last speck of magic left them. And she has to wind between each photo. Aya is another youkai whose legend benefited from being a friend of the first Shogun, though she was always an odd bird among her society. A rumormonger and photographer who was constantly interested in the world outside tengu society, Aya flitted across Gensoukyo and then the world, getting (and making up) stories. As a Caster she's somewhat mediocre. Her camera abilities, and story creation don't really offer much offensively, and she lacks actual understanding of magecraft. Her real power is in her control of the wind. Still she'll happily report on the conflict while she's here. Perhaps even making a little if it's a dull stretch. Hatate can create a "Study", where she writes and prints her articles. The battle techniques taught by the Tengu. Hatate was a poor study to start and let her skills slack off. Provides bonuses to close-combat power such as swordsmanship, archery and spearmanship, as well as Skills such as Military Tactics and Magic Resistance. Cancel spells with a chant below two verses. Cannot defend against magecraft on the level of High-Thaumaturgy and Greater Rituals. Hatate's enhanced magic resistance comes from her time in hell where she learned to resist the spirits floating about. As a elemental of the air, Hatate can control the winds as a Marble Phantasm. At this level even gale force winds can be controlled. She lacks Aya's creativity, but she has stronger magical power. The ability to take a picture of anything that she knows exists. This power can bypass dimensions and realities, allowing for remote surveillance of anyone, anywhere. It's only limitation is that it takes some time to take the photos. The manifestation of Hatate's insane devotion to reporting the truth. By researching, writing, and publishing an expose on someone, she can alter public perception of her target even if no one reads her article. This can lead to people knowing the person's name, actions, abilities, and even influence them towards liking or disliking the victim. As the power targets the populace not the subject of the article, magic resistance or mental pollution is meaningless. While the article represents Hatate's truth, she will never stoop to using lies or even speculation with this power. Often called the Shogun's spymistress, Hatate honestly had far more connections to the old hell. However no matter what, she was famous for her dedication to her ideal of truth. As nebulous and dangerous as that is for a youkai. Her summoner will find her young, idealistic, but not totally clueless about life and combat. Still she's a terrible choice for a war. She's only barely a caster, and her powers are great at helping other servants, but useless one on one. Add to that her unwillingness to sacrifice herself for lies and you end up with a rebellious servant who can't win the war on her own. Sanae can create a "Shrine" which enhances her mystical powers. Sanae can create fortunes, holy amulets and other trinkets. A living goddess and a figure of worship in her own right, Sanae has a fairly high divinity. Sanae is a master of shinto magic, along with several other rituals. In addition her connection to her goddesses gives her access to a number of other magical rituals and spells. However she is limited to acceptable divine spells. As a living goddess, Sanae can perform miracles. Unlike the wishing power of the grail, or the miracles of saints however, Sanae can't create new miracles easily. Instead she has the unique ability to duplicate previously performed miracles. Given the range of divine miracles across time however that gives her access to an incredible range of abilities. From turning water into wine, to stopping the sun in the heavens. She can try use her powers outside existing miracles, but it mostly just boosts her luck. It's difficult to discern whether this Sanae is the one from the early era of Gensoukyo, or from during the early New Era. After careful study, it's most likely she's an amalgamation of the two legends. Or perhaps if rumors of her reincarnation are true, the same legend twice over. In either case Sanae is excitable, cheerful, and kind hearted, if occasionally somewhat dense. The grail seems to leave out some modern knowledge, not enough to hinder, but enough to make her obviously displaced. Sanae is a passable caster, though her Noble Phantasm is quite expensive for the Magus commanding her. She's unlikely to thrive in a war though. While she won the Grail War during Gensoukyo's golden age, it was mostly because the stronger servants all killed each other. A Skill that expresses one being a perfected goddess from birth. A composite Skill that comprises the Skill Divinity, preserves the absoluteness of the mind and the body, repels all mental interference, prevents the body from growth and prevents the figure from change no matter how much calories are absorbed. Kanako can ride anything, including divine beasts and even dragons. Such is her right as a goddess. She can also ride onbashira logs, which are not normally mobile. Slightly low for a goddess, her Charisma is still enough to lead armies and nations wherever she wishes. A genius at tactics, she's actually less adept at grand strategy. However she understands her weakness and can appoint subordinates to cover her weaknesses. As the goddess who revolutionized technology in a fantasy world, and magic in a technical world, Kanako is known best for this skill. It allows her to suppress her divinity in situations where it would be detrimental. A representation of the renewal of the Suwa shrines, Kanako summons sixteen onbashira that fly across the land. The holy pillars deal great damage to anyone they hit, and dispel magics on the area. At the end of their flight, the pillars slam into the ground, healing and strengthening Kanako. Another spirit that's at the limits of the grail system. Kanako Yasaka has the good graces to appear only as a reasonable servant instead of using her full godly might. Of course Kanako has claimed several godly titles since the New Era. This is her in her Eastern form. The conqueror of Suwa, and ruling god of the new Japan. As a Rider, Kanako loves tactics, and happily plans out every encounter just for fun. However she'll still happily meet her enemies on the field of battle. She stalls with her blade and tessen, until she gets the ability to use her onbashira to strike a killing blow. Masters had best match her in both cunning and bravery if they don't want to be swept up in her wake, or left behind. Suwako can safely absorb curses and evil magic without suffering ill mental or physical effects. This grants her a resistance to curses used against her as well. Suwako's true name revelation comes from her long life and research. In general anyone known well enough to appear as a servant is likely to be known by the Goddess. However those exceptions (like Nameless) or future servants will resist her abilities. As a ruler Suwako has the ability to use Command Seals, like a master. Suwako is a native goddess and part elemental. Thus she can wield earth and water as she wants, manipulating it as a Marble Phantasm, or divine miracle. She can also swim through both freely. Suwako calls upon the curse gods she controls. Appearing as phallic lizards or snakes the creatures the evil deities strike her foes then are bound again, leaving only their curses behind. Suwako can control the area the curse gods affect, but not the curses they leave behind. The curses are random, from impotence and bad crops, to sickness and death. No sin or virtue determines the curse. Only the whims of the dark gods and random chance. Judging from her appearance as a Ruler, Suwako has no strong wish. On review of past information about the goddess, this seems to fit her actions. She's willing to let Kanako do the wishing. She just runs things where she can. As a Ruler Suwako will be laid back, chatty, and mischievous. She's also unlikely to interfere. However if anything does require her attention she'll come down on it like a mountain of bricks. She has no interest in fair play or righteous combat. She goes to win. Yuuka has a chance to see and understand the true name of servants she views. This is a benefit given by the grail, and depends on an opposed luck check, meaning it doesn't always succeed. As a ruler Yuuka has the ability to use Command Seals, like a master. Yuuka can create a Hanging Garden giving enough time and effort. She quickly set up a Garden, which is the equivalent of a Workshop and enhances plants in the area. Yuuka is an accomplished mage who knows many spells across all branches of magecraft. No one is quite sure how many spells Yuuka had but she's studied many unique and rare grimoires. Yuuka is a plant elemental, and she has power of all plants with a special bonus to controlling flowering plants. This ability is considered a Marble Phantasm, and Yuuka will never use this to harm plants that aren't hostile to her. Yuuka creates a temporary copy of herself, then summons up her strongest spell. A blooming swath of utter destruction that brings death and rebirth to all in it's path. One of the most feared spells ever created, cast twice in synch. A worthy attack for a Ruler. It's surprising that Yuuka is primarily summonable as a Ruler. While it's obvious the feared Flower Master has the power, it's odd she has no strong wish she wants granted. Perhaps her power made it so she got everything she wanted out of life. No matter what the reason, pity anyone summoned to a Grail War with her as a Ruler. While she acts above everything, when she does make a move it will be with massive power that goes beyond overkill. Masters will be hard pressed to get her to even listen to her, much less act as they wish. Hides one's presence as a Servant. Suitable for spying. The rank of Presence Concealment drops considerably when preparing to attack. For Medicine however, this attack condition does not apply to poison attacks. As a living doll, Medicine lacks vital points, and has a resistance to physical damage. An arrow through the chest won't affect her much, but shattering an arm would be as effective as on a human. Medicine views dolls the same as humans, and tools to be almost human. This distorted view grants her great resistance to mental attacks and possession, but makes it painfully difficult to come to an understanding with her. Medicine's understanding of existence is centered around poison. After all poison is the heart of her existence. As such she views the world as conflicting poisons. And so was born the reality marble within her, a swirling world of poison and death. Medicine can create any poison in any dose and release it into the area around her. In addition she's immune to all poisons, accepting them into her body. Given how loose the definition of poison is, and Medicine can perform a number of incredible feats, ranging from killing armies to healing diseases. The famed poison doll, Medicine is possibly the most deadly assassin in history. Not in single combat, but in the ability to murder thousands with her poisons. Still she's no slouch in single combat either, as her actions in the Lunar War show. Her prefered tactic is to linger near a foe, suffusing the air with odorless toxins until they collapse and die. Medicine is a surprisingly childish servant. Stories about her don't mention how innocent she is, when not killing people. She also has an insane love of other dolls, so Masters will have a hard time with her. In fact humans and youkai in general will have difficulty with medicine. Only tsukumogami really can work with her easily. Komachi can sail any small craft on any surface, including air or stone. She prefers two person rowboats, and can move them without rowing using her natural ferryman powers. The power to destroy beings created purely by conceptual energy, or those anchored by faith. This ability transcends weapon or skill, allowing even normal attacks to kill such beings. At rank B Komachi can permanently kill any lesser god, or temporarily kill any greater god. The wealth of every human who died makes it's way to the ferrymen. Komachi is so rich she can just throw money away as an attack. As a shinigami, Komachi can banish lesser spirits with no issue. Only strong self controlled sentient undead can avoid her power. Komachi can manipulate distance to some degree, giving her the ability to make tight dodges and to home attacks on foes to a limited degree. At this level she can twist space up to a meter within sight range. Calling upon the twisting currents of the river of death, Komachi can create an area of space that utterly negates movement in and out. Those trying to move within the zone advance at a crawl. This allows Komachi to trap her foes in place as she attacks them. Or flees. Komachi herself is unaffected. Strangely the effect doesn't alter how fast they move personally, just how far they go as they move. Thus someone affected by her ability can block or even dodge to some degree. They just can't move out of the way. Ever since Eiki Shiki and Komachi Onozuka became legends, people wondered why Eiki Shiki kept the lazy shinigami around so long. With this information from the grail, we finally have an answer. Eiki kept Komachi as her Godslayer. A weapon to use against divine beings that usurped the order. Why she chose someone as lazy as Komachi for that post is still unknown. Godslayer candidates are admittedly hard to find though. Komachi is a carefree servant, likely treating the Grail War as something of a joke. However when fighting she'll use her scythe, boat, and coins to her advantage. She's also likely to be quite caring towards her Master and children. Assuming her Master is worthy of such respect. Eiki can see the sins and past actions of anyone she looks at. This allows her to know the target's True Name, Alignment, and Powers. As this comes from her power as judge of the dead few things short of True Magic can block it. As a ruler Eiki has the ability to use Command Seals, like a master. Modifiers are added when using torture tools to deal damage. Because it strengthens bloodshed and agony, further damage is continuously added after the ordinary damage. Eiki has knowledge of every conceivable torture. However since she's used to dealing with the dead, she's fuzzy on how much punishment living beings can survive. While appointed, Eiki is still a greater god, and retains her divine status. While similar to Mana Burst and Mana Defense, Eiki doesn't need an object to channel the mana into. Instead she can simply fire pure energy blasts and shield herself with raw power, ignoring the need for magecraft. The mirror that forces someone to view their own sins, Eiki can use this to summon a copy of someone. That copy will attack the original, using all their skills and powers to full effect. While the summoned fighter will only attack their opposite, and can only last for ten minutes, it has no regard for it's life, which gives it a short term advantage. The full judgement of the Yama. Instant and total oblivion for anything caught in it's effect. Raw death and entropy wash over the area sending the victims to the beyond. Eiki will never use this power on living creatures, or even odd beings like servants, considering it a spell that only the current Yama should use. Most Yama are known only by their position. Eiki Shiki is a rare example, having not only led a purge of the heavens, but then resigning her position tens of thousands of years early in order to get the system working again. She's considered to have helped fix the celestial order that Tenshi shattered in order to expose the rot. Unsurprisingly, Eiki is a very by the books sort of woman. She believes in the rules, and in their justness. However she does deeply love and respect people, and wants them to do the right thing and fix their ways. Servants and Masters alike should expect many many lectures from her about their actions, even if she's slow to intervene. Chen can freely shapeshift between human, cat, and nekomata forms. Chen knows eastern magecraft and can use it to a fair degree. As a Rider she has lost some skill, but maintains her summoning and gap mimicking abilities. Chen can communicate to animals freely. However this doesn't make the animals smarter, or even make them like her. And as a cat negotiations are difficult. Chen can possess or mind control almost any living mount, barring a few Divine Beasts and Dragons. She can also control non mounts like humans, weaker youkai, or dogs. She can't control complex machines though. Chen calls up two lesser oni to serve as her weapons. Possessing their bodies, she unleashes them as puppets to her will, using their massive supernatural strength to crush her enemies. While these are low class oni, they're still some of the most powerful youkai in existence. The Black Cat of Ill Omen is known mostly as Ran's shikigami. Even now after the fox's death and her own ascendancy she's in the shadows of the other Yakumo. Still she's a powerful figure in her own right, and her mastery of youkai control spells makes her feared among the people. Chen seems young and brash, but she's actually quite intelligent, and uses her spells and possession powers to good effect. She'll rush around getting the proper setup, but then she'll wait calmly to pounce, like a proper cat. And like a cat she doesn't think much of "Masters." She'll work with people who treat her nice, but she'll never be servile. Alice can create an Atelier, a Workshop that specializes in item creation. Alice specializes in creating dolls. When focused on doll creation she can even create sentient dolls, given enough resources and time. Alice is a skilled magician who knows almost every field. However she has personal issues with elemental manipulation, causing a slight weakness in that area. As one chosen by the Grimoire of Alice, she is blessed by the muses of storytelling, acting, poetry, dance, and puppeteering. All skills and magecraft related to those fields are enhanced. The inexhaustible supply of doll warriors at Alice's command. These smaller dolls can wield weapons, serve as a magic conduit, and explode at a whim. However the dolls are connected to her by her strings, so she can only use them in close proximity. While a weak noble phantasm, it requires no magic from her master, so she can use it whenever she needs to. As the most knowledgeable Alice, she has turned the Grimoire into a weapon of her own. By performing a High Thaumaturgy ritual, she can open a link between the World and the Fantasy within the Grimoire. The area affected starts small, but increases in size as she adds stanzas. Every target within the area of effect is sucked into the story of the Grimoire. A world where "Alice" is the sole heroine. There is some danger in using this offensively though. Other young girls might become an "Alice." And there are heroes and Noble Phantasms capable of destroying a world. However most will at best be stranded in an alternate realm, with escape being very difficult. Alice is interesting, in that she's perhaps the most well known Alice, and yet she pales in comparison to her more rowdy companions. Still the Rainbow Colored Puppeteer carved her name into history with her innovative dollcraft techniques, and a willingness to stuff high explosive devices into plush toys. A hybrid caster, she'll often clash with other Servants behind her doll screen. However she's not very big on conflict, and will often retreat if she's not winning. Similarly she's harsh and judgemental, especially to other Servants and her Master, but reasonable. She'll do her best to crush her foes, in a dazzling display of puppetry. Capable of calm analysis of battle conditions even when in danger and deduce an appropriate course of action after considering all possibilities to escape from a predicament. Since she has other means of gaining speed, Youmu can freely use her Mana Burst abilities to enhance her blade. Indeed, she can use her sword to fire bullets or transform it into an energy blade at whim. Youmu can parry and reflect any projectile that does not involve True Magic, High Thaumaturgy, or a Noble Phantasm of B rank or higher. Those blows she can't reflect she can often still block or dodge, so long as she sees them coming. The sword that cuts 10 ghosts in a single stroke. Forged by the Ippon-Datura, the blade can, in the hands of a skilled wielder, cut anything. This includes ghosts, phantasms, and spells, not just mortal materials. Even heroic spirits will have to avoid having their noble Phantasms being cut in battle, though other knight class servants should be able to do it if they aren't totally outmatched. The sword that slices confusion. While strangely named, the true power of this blade is it's a conceptual weapon as well as a real one. It contains both the concept of cutting in addition to it's edge, and removes any 'confusion' that the target has been cut. This slows healing, and stops any abilities that unmake wounds. It also weakens mental states like Mad Enhancement, Mental Pollution, and things like Battle Continuation based on willpower. Youmu merges then separates her human and ghost halves, giving her phantom form a body and making her human form more spiritual. This raises her magic resistance to B, and gives her two bodies to fight with independently. The second master of the Konpaku fighting arts, and one of the most famous swordswoman of her era, Youmu had a much less impressive start than most master swordsmen. However once she altered her bladework to fit her smaller frame, she rapidly assumed a near invincible reputation with the blade. Even in her old age she managed to draw Sakuya while the maid was using her full power. The grail will likely summon her at her full power, a relentless Samurai who faces death with a calm eye. She'll use both swords and her speed to attempt to end fights quickly. And she will serve her master loyally, and without question. At least unless they are a complete monster. Due to the alterations in reality (and in the grail system) Yuyuko can actually be summoned in her position as Princess of the Netherworld instead of her living self. As a ghost she is purely composed of spiritual energy and ignores physical items whenever she desires to. In addition her Endurance is actually determined by her Magic statistic. Yuyuko can control all ghosts and spirits. Non intelligent spirits can't resist, intelligent spirits can, at best hold themselves motionless, effectively paralyzing themselves to resist. Suitable for spying, the rank decreases greatly when an attack is prepared. In addition, the chill of death surrounds the area, making people jumpy and suspicious. While similar to Mana Burst and Mana Defense, Yuyuko doesn't need an object to channel the mana into. Instead she can simply fire pure energy blasts and shield herself with raw power, ignoring the need for magecraft. Yuyuko separates someone's soul from their body, killing them instantly. This ability can't be avoided or resisted. Only an immunity to death, or being dead already can avoid it. Yuyuko will never willingly use this ability, though she can be ordered to with a command seal. The ability to summon the princess of the netherworld is strange, but makes a little more sense now that youkai have become part of the populace instead of merely conceptual monsters. Still, Yuyuko fares poorly due to the class system of the grail. She's pushed into the Assassin class, limiting her magical abilities. With her reluctance to use her trump card she has little to offer in a Grail War. In addition her wish almost certainly is to create life somehow, which runs against the rules of the universe. Probably the reason for her poor luck. Yuyuko plays the role of a vapid glutton, casually lazing about. However she's very intelligent, and she'll often just happen to wander out and end up in the right place at the right time. Or to use the perfect tactic. No matter what though she'll be a frustrating servant to handle. Can create a "Hidden Village" superior to a Workshop. It especially enhances her scrying abilities. She has the ability to create mystic relics and codes, but she rarely does so. She can transform into almost any shape, though she prefers her humanoid kitsune form. Ran knows a number of spells, but she specializes in surveillance and boundary manipulation. She's one of the two magicians in existence capable of duplicating Yukari's signature ability. Ran is a master mathematician, and she's put her calculations in use in combat. This skill grants her a bonus to dodging, close combat and grappling moves. Ran's story and nature are tied far closer to her stint as a shikigami than any other hero. When summoned she appears in that form, preventing her from gaining a true Noble Phantasm, but making her a true shikigami to her master. This means she has a familiar link to her Master, and can access any of her Master's powers and spells. In addition she gains a bonus to all stats when she's acting as her Master desires, even without the use of command spells. However when acting against her master she suffers a penalty in all stats. Ran Yakumo is a subject of intense historical debate. As a shikigami and kitsune, Ran is a huge series of magical contradictions. As the sage, ruler, and protector of Gensoukyo for a period of time Ran similarly has a number of faces she used to maintain power. The only thing everyone agrees on is she's a coldly calculating genius, but not deliberately evil. She might be the most Servant like Servant. Her shikigami ability gives her master great control and ability to use her casting ability. In addition she's a close combat caster, using her strength and calculations to grapple and kill her enemies. She's not an unquestioning servant, but it will take a lot of effort to get her to disagree with her master. It is possible for a Servant to stay in the world for one day without a Master. Yukari can twist boundaries. This insane power has been lowered by the grail, but she can still teleport anywhere, teleport anything to her, and perform a huge number of magical and quasi magical effects. As an archer she will use her power to catch and fling objects (or even light) at great speed. Yukari's mental state is alien to humanity, yet she understands humans well. Grants all the benefits of Mental Pollution, but none of the downsides. Yukari can defense from any projectile of any power, at the cost of not being able to attack. However she can later use that projectile as a weapon herself. As an ascended Mokumokuren, Yukari can focus on a building she can see. Within that building she can spy on any room she desires without giving her presence away. However those within the building will feel uneasy, and sense they're being watched. As an archer, the truly insane abilities innate to her boundary manipulation are sealed. However she can still summon meteors traveling at near lightspeed to slam into her enemies. The resulting impact explosion can damage anything from the size of a house to that of a continent, causing a mass extinction class event. In addition the ability is relatively cheap, meaning she can use it repeatedly without draining her master. Yukari's grand plan, the rain that severed the old order and changed reality to favor youkai. Despite it occurring after her death, it's seared into the reality of the world. Blood rains down upon the land over the area of a small county, granting youkai and other monsters a two rank bonus to all abilities, and granting any humans a one rank boost and the chance to become a youkai. Meanwhile divine beings suffer a one rank penalty. It also sends everyone in the area into a wild rush, making them impulsive and power hungry. However the mental effect is weak and easily resisted. The biggest weakness of this ability is Yukari has to prepare it for at least a week and it affects everyone. Though it can trigger after her death. The youkai sage of Gensoukyo, Yukari Yakumo is a name burned into history. Perhaps the most famous youkai of all time, she's still enigmatic, even to other youkai. Yuyuko and Ran are perhaps the only people who understood her. Still she's undoubtedly a powerhouse. Summoning Yukari is similar to summoning incredibly powerful heroes like Gilgamesh. She's unruly, haughty, and lazy. In addition she thinks differently than almost anyone and she'll happily wander about doing as she pleases with her teleportation powers. The only benefit is she's possibly one of the strongest servants in existence, with the ability to fling stolen relics or spells at whim at her foes. Yuugi's Strength and Endurance are vastly above human limits. However as an oni she has the traditional oni weaknesses to fried beans and holy objects. Oni are better than humans and Yuugi is the best of the oni. This ability represents Yuugi's ability to perform any mundane skill based around training that does not include subterfuge at a rank superior to humanity. As the oni who stuck to oni principles the best, she has the highest rank in this skill. Years of easily crushing humans has left her incapable of accurately judging and reacting to a foe's power. If facing an opponent with divinity lower than A+, she can't be bothered to use her full strength, lowering her attributes by several ranks. Yuugi can control supernatural elements. This is vague because the ability is vague. The supernatural is not magic, or even youkai power, but the strange and unexplained. Thus her control is not over magic, but over any event humanity does not fully understand, or that bears mystery. It also lets her throw around magic blasts. The ultimate demonstration of Oni power and superiority. Yuugi takes three steps forwards and knocks her foe out. It sounds simple, but it's terrifyingly complex. The final blow shatters the air, causing a wave of energy that punishes those that try to flee or to interfere with her battle. Similarly her blows while stepping forwards are devastating, meaning that those who rush into them are stunned and helpless against the final punch. The only way to survive is to dodge without giving ground. Strangely, the blow is in fact a knock out, not a death blow. Anyone struck cleanly is knocked unconscious for sure, but is never killed. This can be of great help or a great inconvenience. Like her fellow Deva Suika, Yuugi is a terrifying force that strains the grail to it's limits. However unlike her fellow, she remainined completely true to her oni nature. While it means Yuugi's more contemptuous of other heroes, she lacks Suika's deathwish. And her powers haven't faded much at all. If summoned she'd be a walking force of destruction, and unlike Suika she wouldn't be aiming to die. But she certainly wouldn't listen to any master, and her whole goal would be to fight. She'd be very friendly about it, but at the end of the day she'd do as she wished until a command seal was used. Easily hated, Satori gains many grudges, but she doesn't like it, meaning she doesn't generate much mana from the hatred herself. However her racial abilities allow her to steal the mana of people who hate her, meaning those grudges both strengthen her defenses and weaken her attackers. Satori's attacks draw upon both her own understanding of pain, and her opponents memories. This increases the damage she does measurably. Linked to her Avenge ability, Satori naturally absorbs killing intent and uses that to both defend and heal herself. Satori absorbs enough power from resentment to instantly heal any blow struck at her with lethal intent. In effect this makes her immune to deliberate attacks, unless the attacker has reached a state of 'no-mind'. She still can be incapacitated by pain though. Satori can read the hearts of those around her. This ability can't be avoided, blocked, or turned off. In addition she must make a mental test to not repeat what she reads and respond to that instead of actual words. By using combat and mild hypnosis to dredge up memories, Satori can unleash a representation of the attack or fight that most terrifies her foe. In addition it's tinged with added fear and Satori's own manipulations, meaning the attack is stronger than it originally was. Unfortunately it takes some time to induce the hypnosis state and open up those memories. Especially if the foe has Mad Enhancement or other resistances. As a youkai named after her race, Satori is really the pinnacle of satori. And satori are naturally Avengers. Only akumajou are more attuned to being hated. However unlike Seija, Satori doesn't like being hated. It naturally happens though. She can't help but spit out what people's hearts say, and she is offended when they hate her in return. Quiet and reflective Satori prefers to be left alone with her writing. She dislikes conflict but when pressed she'll use her abilities to turn her foes greatest fears against them, adding her own resentment to the mix. Her natural ability to survive attacks will also give her an advantage, though it's not hard to make her unable to continue fighting with a few good hits. While this should be obvious, dealing with Satori is painfully difficult for non animal youkai. Her master will not have an easy time of it, and Satori is unlikely to work hard to make it easier on them. This skill comes mostly from her class. Rin's actual riding ability was probably limited to her jumping on mounts in cat form and just following them along. It grants her above average riding ability with all natural mounts. In addition she can "ride" her cat cart, the transportation that gave her access to the class. She has only a minor skill in Magecraft, but she is excellent with necromancy, fairy control, and hellfire attacks. She also knows both divine and black magic. This is in addition to her necromantic powers as a kassha. She can transform freely between kassha and cat form. The ability to retreat and reset a battle. Bonus effect of returning battle conditions to what they were at the beginning of the match (1st turn) and restores the condition of this Skill to the initial value. Rin has the aura of old hell infused into her existence. This makes the area around her "more hell like." This makes necromancy easier, but more importantly enhances hell and fire fairies in her aura. Fairies near her can respawn almost instantly. Orin developed this ability by stealing a famous power of an older heroic spirit that has sadly faded into history. When activated this ability floods the area with even more necromantic and hell power, raising corpses as the living dead and sending fairies into a frenzy. In the end the area will swarm with regenerating fairy cosplayers and zombies, creating a hellish mess of battle. While each enemy is individually weak, none of them can be killed permanently barring unique powers. Researchers were curious which class Rin would be placed into, due to her odd abilities. However her corpse stealing wheelbarrow seemed to give the grail enough excuse to make her a rider. Given riders also have command skills, this lets Rin use her full power as a leader of zombie fairies. A cheerful servant, one must always remember no matter how friendly, Rin is a cat. And as a cat she's likely to do her own thing without asking her master. Still she offers great power with few moral hangups. A natural understanding of nuclear power and physics and control at the atomic level. With this she can master fusion and fission at whim, and understand how to tweak the power to her needs. Birds need to fly free sometimes. She can last without a master for about a week. She can swap between goddess form and crow form. She can also assume a "dire" crow form if she desires. Calling upon all her powers she unleashes the might of the reborn sun, blasting the area with heat and light. The attack is something like a small nuclear device going off. She can control it somewhat, and the damage does decrease as it gets further away from her, but it'll still probably destroy a few city blocks at minimum power. She is safe from the blast. Her master is not protected. Kill anyone who summons her for a grail war. The part of Utsuho that corresponds to her eastern goddess form. Utsuho is a cheerful happy woman, who's quick to fight and quick to forgive. She'll happily blast her way through any grail war she's summoned to with a smile. Unfortunately she has no concept of "minimal collateral damage" and while her servant form is weaker, she's still capable of leveling entire cities at a whim. And not all that disinclined to do so. Koishi's stealth is based on how much she's letting her conscious mind act. When acting unconsciously even attacks won't decrease her stealth. However when acting consciously her stealth drops more and more ranks. When Koishi is using her unconscious powers, she can't access this ability. However when her heart opens and she starts acting consciously, she regains the ability to read hearts. It might be better to say humanity has the mental pollution here. The more in tune Koishi is with her unconscious, the harder it is to affect her, and the more difficult it is to come to an understanding with her. Being around Koishi is unnerving. The Crimson Nightmare Witch said it was like being judged by your family all the time. All abilities caused by Mental strength are lowered. She can focus this power to also spark paranoia and even hallucinations in a victim. It's hard to say if Koishi has ever used this power, or if it's merely something people are afraid of. With the grail however that issue is moot. Koishi can shut down someone's unconscious mind. The victim's heart, breathing, and instincts all shut down. Death usually follows. Koishi Komeiji appears in spots on the records of history. Sometimes a hero, sometimes a villain, sometimes just there. Her interactions with Kokoro, her sister, and of course the famed Marisa Kirisame grant some body to our understanding of her. But the very idea of someone who's in tune with the subconscious is strange. As an assassin she has perhaps the best presence concealment in existence. At the cost of forgetting what she's doing. As such controlling her will be difficult. Especially since she might not appear for her master. At least it will be nearly impossible to track her back to her lair.